From: Windsor Castle; Chevening; Grosvenor Place [London]; the British Museum; 'The Lord Warden', Dover. 1859 and 1860. The five letters total 10pp., 12mo. On five bifoliums. In good condition, lightly aged. An interesting correspondence, from one of the trustees of the new National Portrait Gallery to its (as yet unknighted) secretary. ONE: 'Brit. Mus. | Saturday afternoon' . 1p., 12mo. Begins: 'Lord Macaulay [another trustee] tells me that he intends to visit the Portrait Gallery with some friends at 3 on Monday.' TWO: Chevening. 2 November 1859. 2pp., 12mo. After thanking him for 'the drawings for Lady Stanhope' he exclaims: 'Another terrible storm yesterday! Undated [after 1864]; Wallington, Newcastle. 12mo, 1 p. Four lines of text. Good, on aged paper with watermarked date '<...>864'. 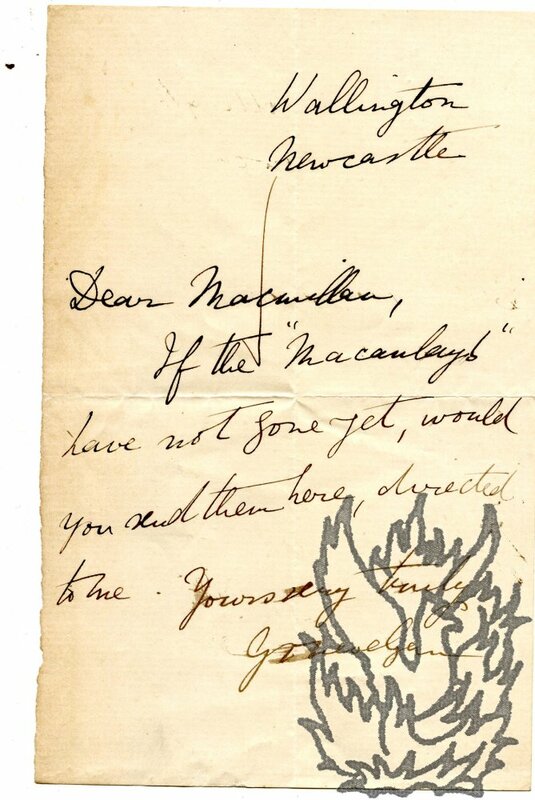 'If the "Macaulays" have not gone yet, would you send them here, directed to me.' Trevelyan was nephew of the historian Thomas Babington Macaulay, of whom he published a biography in 1880. 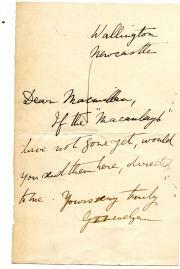 Autograph Letter Signed to Henry Fawcett. 9 October 1882; on letterhead of the Chief Secretary's Office, Dublin Castle. 12mo, 4 pp. Good, on lightly aged and creased paper. The 'appointment of examiners' is entirely a matter for 'the Commissioners of Intermediate Education'. However Trevelyan will be glad 'to send the papers on to the proper quarter, and will do so accordingly'. He is 'much obliged' to Fawcett for his 'kind expressions about my proceedings here. It is a very queer post, and I always feel as if on the brink of an appalling escape.' He has been 'much struck' with the success of Fawcett's policy at Trinity College, Dublin. The Trevelyans 'spent some days in Salisbury in 1879. Autograph Note Signed ('G M Trevelyan') to unnamed male correspondent [Rev. E. J. F. Davies]. The reformers of the Anglican Church, and Mr. Macaulay's History of England. A postscript. Octavo. 16 pages. Disbound pamphlet from the Churchill Babington collection, and with his ownership inscription (slightly cropped at head) dated June 1849. Very good on slightly discoloured paper, and with first and last pages somewhat grubby. Babington and Macaulay were related. The sin of conformity. An appeal to the episcopalian of the town and University of Cambridge. Octavo. 64 pages. Disbound pamphlet from the Churchill Babington collection. Very good. 'In the spring and autumn of the year 1859, four or five vestries were summoned in the parish in which I reside for the purpose of laying a Church-rate. The numerous entreaties made to the supporters of that measure to refrain from it, were met by a resolute, and not always by a courteous refusal. The sabbath. A paper read at the conference of the Evangelical Alliance, held at Geneva, September 2. 1861. Octavo. 16 pages. Disbound pamphlet from the Churchill Babington collection. Very good, though paper somewhat discoloured and lightly foxed. A letter to His Grace the Archbishop of Canterbury, on the present wants of the church. Octavo. 16 pages. Disbound pamphlet from the Churchill Babington collection. Good, but with first and last pages somewhat grubby. Strictures on the four sermons on tradition and episcopacy, preached in the Temple Church, by the Rev. Christopher Benson, Master. Octavo. 55 pages. Disbound pamphlet from the Churchill Babington collection. PRESENTATION inscription to Babington from author (dated February 1840) on light-brown printed front wrap. Very good, but with front wrap grubby and foxed, and rear wrap lacking. Scarce: only three copies on COPAC. Capital punishments unsanctioned by the gospel and unnecessary in a Christian state. A letter to the Rev. Sir John Page Wood, Bart., B.C.L. Octavo. 22 pages. Disbound pamphlet from the Churchill Babington collection. Good, though on slighly discoloured paper and with first and last pages somewhat grubby. A letter to the Rev. E. B. Pusey, D.D., regius Professor of Hebrew, and Canon of Christ Church, on the publication of No. 90. of the Tracts for the Times. Octavo. 13 pages. Disbound pamphlet from the Churchill Babington collection. Good, but foxed and with title grubby and stained. Cutting [from the Guardian, September, 1890] of correspondence relating to Cardinal Newman and the authors of 'Tracts for the times' loosely inserted. Autograph Letter Signed to 'Mr Phillimore'. 27 May 1895; on letterhead of the Secretary for Scotland, Dover House, Whitehall. Second baronet (1838-1928), English Liberal statesman and historian. Two pages, 8vo. Very good, with three small mounts adhering to verso of blank second leaf of bifoliate. Reads 'I am much obliged for your letter, and the kind invitation of the Palmerston Club to their annual dinner on Saturday 15th June at the Clarendon Hotel, but I regret very much that I am already engaged for that day'. Signed 'G O Trevelyan'. Autograph Letter Signed to Percy Corder. Second baronet (1838-1928), English Liberal statesman and historian. Two pages, 12mo. In good condition on foxed grey paper, and with traces of previous mounting adhering to verso of blank second leaf of bifoliate. 'I am sorry to say that, as I have written to Mr James Watson, I cannot get to Newcastle or the Tyneside till the 1st. October, when I am to preside at the Welsh Disestablishment meeting.' Signed 'G O Trevelyan'.